February 6, 2019, Vancouver, BC – Mundoro Capital Inc. (TSXV: MUN, www.mundoro.com) (“Mundoro” or the “Company“) is pleased to provide an update for the two drill programs currently ongoing on the Company’s licenses in the Timok Magmatic Complex (“Timok”) in eastern Serbia. Borsko is one of the four licenses being sole funded by Japan Oil, Gas and Metals National Corporation (“JOGMEC”) as part of the JOGMEC-Mundoro option agreement announced in August 2016 (Figure 1: Location Map). The Year 3, Phase I drill program updated on October 23, 2018, which included approximately 7,200 m of diamond drilling in 7 drill holes, has been extended to approximately 9,000 meters over 9 drill holes to be completed by mid-March with the drill results by the end of March. The current drill program aims to test: (i) Target 1: lateral extension of the hydrothermal alteration and mineralisation intersected in drill hole 17-BJ-11 (15m @ 1.04 g/t Au and 6.9 g/t Ag) further to the east-northeast is associated by a CSAMT anomaly; (ii) Target 5: a new target identified to test IP chargeability anomaly coincident with magnetic low anomaly at favorable structural intersection located 1,500 m north-northeast of Target 1; and (iii) Additional targets: identified by both structural interpretation and geophysical programs using CSAMT and ground magnetics within the exploration license further to the south. Borsko is located directly west of the Bor copper porphyry underground mine and the Veliki Krivelj copper-gold porphyry open-pit mine, all located in the central portion of Timok. Timok is one of the most prolific metallogenic domains in the Tethyan Belt with deposits such as the Cukaru-Peki copper-gold deposit and the Bor copper porphyry underground mine and the Veliki Krivelj copper-gold porphyry open-pit mine. 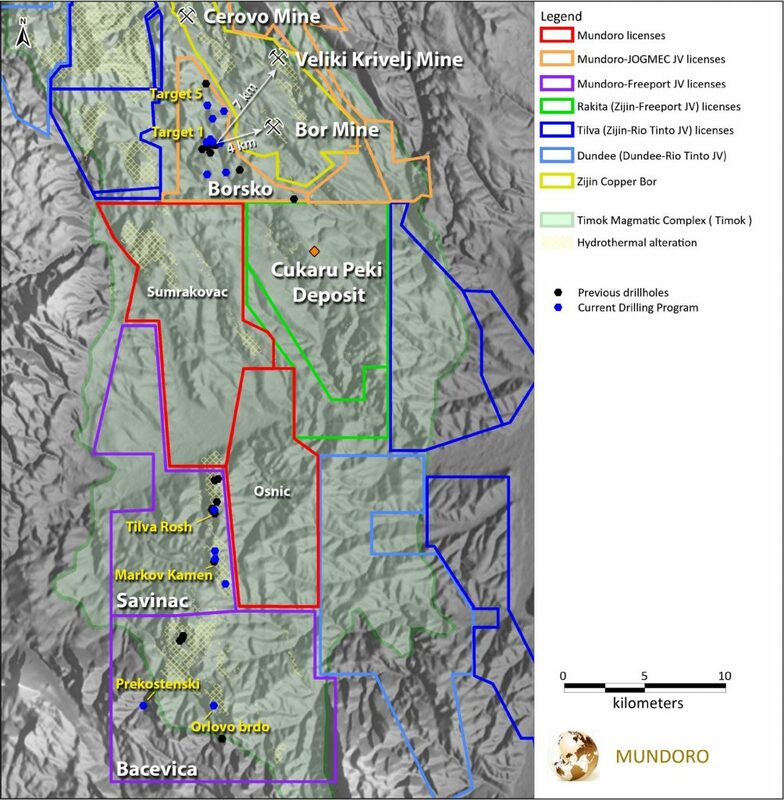 This drill program is being sole funded by Freeport-McMoRan Exploration Corporation (“Freeport“) as part of the earn-in agreement (“Agreement“) with Freeport, in which Mundoro has granted to Freeport an option to earn-in to Mundoro’s Savinac and Bacevica exploration licenses (the “Freeport-Mundoro JV Projects”). Savinac and Bacevica are located within the southern portion of Timok in eastern Serbia (Figure 1: Location Map). The Year 1, Stage 1, drill program announced October 30, 2018, which was extended from 3,550 m of diamond drilling in 5 drill holes to approximately 5,000 m in 7 drill holes, is ongoing and expected to be completed by early-February with drill results to follow within a month. The current drill program, aims to test the following four target areas: (i) Tilva Rosh: epithermal gold target which contains 12 meters of 30 g/t gold and 171 g/t silver from rock chip sampling. Combined drill results from approximately 2,000 meters of drilling in 2014 and 2017 have interpreted the epithermal target to be proximal to a copper-gold porphyry system related to a large area of advanced argillic alteration, highlighted with a molybdenum anomaly followed by outwards zones of lead-zinc geochemical anomalies; (ii) Markov Kamen: epithermal target identified by several copper-gold-in-soil geochemical anomalies related to a broad zone of argillic and advanced argillic alteration located at the southern portion of the Savinac license. Drilling from 2015, which intersected hydrothermal breccia, massive sulphides and vuggy silica, appears to be a high sulphidation style epithermal system controlled by NW structures; (iii) Prekostenski: porphyry copper-gold target identified from geochemical analysis of soil sampling and trench results containing 55 meters of 0.28 g/t gold and 0.21% copper located in the western portion of the Bacevica license. The exploration work identified chalcopyrite-magnetite mineralisation hosted by potassic altered andesite; and (iv) Orlovo Brdo: broad zone of phyllic alteration with gold and copper anomalism that remains untested at the central portion of Bacevica license. Mundoro ended Q4-2018 with approximately C$4.8 million in treasury. The remaining two Timok licenses, Sumrakovac and Osnic, are available for joint venture. As such, Mundoro continues discussions with third parties for these two licenses Sumrakovac and Osnic as it is the Company’s continued view to establish partnerships to fund exploration activity for testing drill targets. Although there are discussions, the Company cannot provide assurance that a transaction will be concluded as a result of these discussions. The Company will keep the market apprised of material developments. This News Release contains forward-looking information and statements (“forward-looking statements”) under applicable securities laws. All statements, other than statements of historical fact, included or incorporated by reference in this News Release are forward-looking statements, including, without limitation, the completion of exploration work on any projects and licenses and results of that exploration work, the prospect of one or more joint ventures and other statements regarding activities, events or developments that the Company expects or anticipates may occur in the future. These forward-looking statements can be identified by the use of forward-looking words such as “will”, “expect”, “intend”, “plan”, “estimate”, “anticipate”, “believe”, “promising”, “encouraging” or “continue” or similar words or the negative thereof. The material assumptions that were applied in making the forward-looking statements in this News Release include expectations as to the Company’s future strategy and business plan and execution of the Company’s existing plans. There can be no assurance that the plans, intentions or expectations upon which these forward-looking statements are based will occur. We caution readers of this News Release not to place undue reliance on forward-looking statements contained in this News Release, which are not a guarantee of performance and are subject to a number of uncertainties and other factors that could cause actual results to differ materially from those expressed or implied by such forward-looking statements. These factors include general economic and market conditions, changes in law, regulatory processes, the status of Mundoro’s assets and financial condition, actions of competitors and the ability to implement business strategies and pursue business opportunities. The forward-looking statements contained in this News Release are expressly qualified in their entirety by this cautionary statement. The forward-looking statements included in this News Release are made as of the date of this News Release and Mundoro undertakes no obligation to publicly update such forward-looking statements to reflect new information, subsequent events or otherwise, except as required by law. Shareholders are cautioned that all forward-looking statements involve risks and uncertainties and for a more detailed discussion of such risks and other factors that could cause actual results to differ materially from those expressed or implied by such forward-looking statements, refer to the Company’s filings with the Canadian securities regulators available on www.sedar.com.